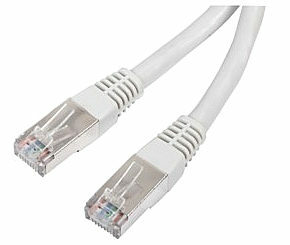 10m CAT6 network patch cable / ethernet cable. CAT6 specification patch cable with moulded connectors. Foil twisted pair (FTP) shielded network cable to reduce interference. Suitable for 10BaseT, 100BaseTX and GigaBit Ethernet. RJ45 network plug each end. 1:1 wired for for connecting computers, hubs, routers, switches, print servers, patch panels, etc. 305m CAT5e Network Cable Black High quality pure copper UTP CAT5e network cable. Stranded core cable 4 pair 8 core Supplied in box, length 305 meters.